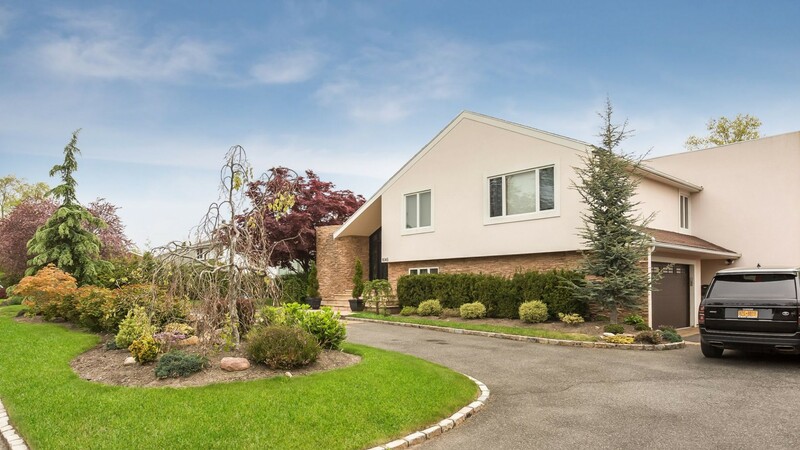 This contemporary stucco house is situated on a beautifully landscaped property in the heart of Hewlett Harbor. The circular driveway, which can hold up to 10 cars, leads you to the attached 2 car garage. As you walk in through the attractive double glass iron doors, you enter into the spacious entryway. On the left there is a large living room with cathedral ceilings and skylights. As you take one step down from the living room, you have a cozy den with a wood burning fireplace. This room is perfect for relaxing. The modern eat in kitchen has a lot to offer. The wood cabinets are topped with dark granite countertops. It also has top of the line sub-zero refrigerator and freezer. The range stovetop is located on the island with a hood right on top and plenty of space for preparation. The formal dining room is lit with a big chandelier and spotlights. From the kitchen and the dining room, you have full access to the backyard through the glass sliding doors. All four bedrooms are located on the top floor. The master suit features high-ceilings with spotlights, a wood burning fireplace, a double glass sliding door leading you onto the private terrace that has breath-taking views, and much more. The master bathroom entails all the luxurious one can wish for. It has skylights, a freestanding jacuzzi, a spacious shower room, his/her sinks, his/her toilet rooms, his/her walk-in closets, a linen closet, and a vanity. From the master bedroom, there is a separate door that opens to a spiral staircase leading you to the gym. There is additional access to the gym from the backyard. On the lower level, you have an additional room that can be used as a guest room, a full bathroom, and a laundry room. There is also a beautiful, fully done, family room that is perfect for relaxing and entertaining. Here, you also have a big wine cellar and a cedar closet for additional storage. Once again, you have full access to the backyard from this level. The beautiful backyard was made for entertainment. It is overlooking the golf-course which provides you with a magnificent view of the sunrise and sunset. Stepping out of the house through the sliding doors, you first enter the deck patio. Here you have space for a table with chairs, a grill, and much more. Walking down the few steps, you have an enormous backyard that is lined with grass. This is a great place to add a pool, a jacuzzi, and whatever one desires. Please feel free to call us at any time to tour this one of a kind home.